As I look back at the incredible year of my first book I want to share my gratitude by reprinting the acknowlegements and thank yous from my book. Thank you for witnessing this journey. As always I would love to hear from you about how you came to read the Cha Cha Files. It has been a group effort. Looking forward to what’s next. There are many in my life without whom this book could not have been possible. I give thanks to those who came before me and to those who risked everything in the name of justice. Thanks to those who believed in me, cheered me on, gave me guidance, created art with me, provided an ear, fed me, and loved me. I am grateful to those who invited me to speak, write, perform and share my early works—my second favorite part about being a writer, second only to the practice of writing itself. I want to thank those who engaged and wrote about my early poems before I realized I was part of a larger conversation. To the newer generation of writers, thinkers, creators: you consistently remind me this work matters and continue to blow my mind with your connections and questions. To those who crossed my path but could not stay, no scarcity politics here. I will always wish you well, for there is enough to go around for everyone. There are too many to thank by name here; too many I will forget. I will just have to write another book and if you stick around I’ll thank you then. Regardless, know that my gratitude is never ending. To la familia Chinchilla and the Stoltz family, to Kathy, Bill, Carmen, Kris and extended family for all things. I especially want to thank the kind souls who read multiple drafts of this collection providing unique and invaluable feedback. There were many eyes and ears, but in particular I thank: Vickie Vértiz, a generous talent, meticulous eye and one of a kind homegirl; Wanda Alarcón, artist scholar conjurer, holder of femme-stories and unique insight; Amalia Ortiz, powerhouse poet and playwright with the right words at the right time; Lorenzo Herrera y Lozano, muse, firebrand and visionary. Willie Perdomo, Thomas Glave, Suheir Hammad, Marc Bamuthi Joseph, Juan Felipe Herrera, Cherríe Moraga, and Sharon Bridgforth for craft, heart and the most life affirming and game changing workshop experiences. To Sarah Guerra a powerful force, a creative strategist, an underappreciated, behind-the-scenes magician, a family-dinner-and-dessert for the weary and for a community of loyal followers, evil conspirators and circus queens. Amiga. Go, Spurs, go. Rio Yañez, for making every moment an art project, for Chicano-Chapina post-apocalyptic-solidarity trading cards, cartoon intellectualism, ghetto-nerd-zine guides to the universe, arguments about commas and feminism. Friend. Yolanda López, a seer, muse, inspiration, trailblazer, funny, witty and kind. My favorite Chicana Feminist artist before there ever was such a thing. Ana Patricia Rodríguez, for my first Central American literature class, for vision and understanding the hunger for justice, for critical conversations, for long distance mentoring. Your work is relevant, necessary and visionary. Gracias. Elmaz Abinader, for tough love, poetics and the VONA community. Patricia Powell, for generous, detailed feedback on the original thesis beast. Truong Tran for my first graduate poetry workshop and for seeing me through to the end. Luz Vásquez-Ramos, LBC homegirl, rockera aventurera, Mexico City international strategist. Raul el Vampiro Diaz, todavía haciendo del Terror. Chingas mucho. Por eso te quiero. Familia para siempre. Eddy Alvarez, for Jota poetics, for mapping LA with love, for writing dates and bringing out the scholar poet in me. You and your work are an incredible gift. Michael Hames-García, for refuge in Oregon to write, for profound conversations, for nourishment both delicious and inspired. Central American filósofos y feministas: Leisy Ábrego, Karina Oliva-Alvarado, Suyapa Portillo, Alicia Estrada, Leyda Garcia, Arely Zimmerman, Oriel Mara Siu, y Arturo Arias. I am in awe of your intellect, creativity and fire. Each one of you has altered my universe profoundly. Melissa Lozano, Lisa Marie Rollins, Kenji Liu, Aimee Suzara, Sara Campos, Ruben C. Gonzales, Chino Martinez, Leah Lakshmi Piepzna-Samarasinha, Julio Magaña Saludado, Cruz Grimaldo, Hugo Carbajal, Virgie Tovar, Julia Eden Ris, Sandra Garcia Rivera, Adilia Torres, Lito Sandoval, Chucha Marquez, Karla Marcela,Yosimar Reyes, Amir Rabiyah, Jaime Barajas, Baruch Porras-Hernandez, Nancy Aid González, Hector Tobar, Darlene Elasigue, Nicole Griffin, Gracie Arguelles, Aleh Hurtado, Felipe Flores, Carmen Iñiguez, Connor Fu, Nia Witherspoon, Adelina Anthony, Dino Foxx, Anel Flores, Maricela Olguin, Madeline Lim, Kebo Drew, Liliana Hueso, Olga Talamante, Galería de la Raza, La Peña Cultural Center, The Chicana Latina Foundation, National Queer Arts Festival (NQAF), Queer Women of Color Media Arts Project (QWOCMAP), National Association of Latino Arts and Culture (NALAC). To the Magic Room Poets for showing up and sweating it out. Adobe Dojo, for practicing pure joy in the desert and a return to play and paper. Friday night writers, No Trigger Warnings writing circle, the Church of Poetry, the Lunada Literary Lounge, Hybrid Performance Experiments, Epicentro Poets, End-Dependence, Rainbow Theater, Spanish for Spanish speakers, Sugarcane, Peacock Rebellion, Teatro Q, VONA Voices, Dos Brujas and especially to all the women of Las Manas: I carry your potent powers with me always. Clarissa Rojas, Teresa Carrillo, Nancy Mirabal, Bridgette Dávila, Katynka Martínez, Alejandro Murgia, Luz Calvo, Catriona Rueda Esquibel, Carlos Cordova, Andrew Jolivette, Gabriela Segovia-McGahan, Alberto Ledesma, Chela Delgado, Frank Galarte, Pedro Di Pietro, Cindy Cruz, Genevieve Negrón-Gonzalez, Sandra Álvarez, A De la Maza, Audrey Silvestre, Sara A. Ramirez, Jen Vaughn, Leis Rodriguez, Sayo Fujioka. To the Kórima Press family: thank you for this sacred work. Tonight! Pan Dulce Poets: Harina, Agua y Corazon 5/14 at la Reyna Bakery on 24th St.
SF International Flor y Canto Literary Festival May 14-16, 2015. The Cha Cha Files: A Chapina Poética (Kórima Press, 2014) by Maya Chinchilla is a timely debut that makes visible the Central American-Guatemalan diaspora and disentangles the myths from the mayhem of civil wars, urban wars, and the wars raging in young hearts. Part memory, part imaginary, The Cha Cha Files honors Central American feministas, Long Beach roqueras, families divided by war, lovers separated by borders, and celebrates the pleasure and heartbreak of femmes, machas, y mariconadas. These poems, stories, and snapshots traverse California coastlines and southern borderlines, cut across tense multi-culti high-school hallways, sing Solidarity Movement songs, mosh through tribal slam pits, and find home in the vibrant Bay Area where radical activists and lovers alike come of age. Chinchilla’s hopeful and uniquely Chapina voice emerges as a significant contribution to U.S. Latina/o literary works. 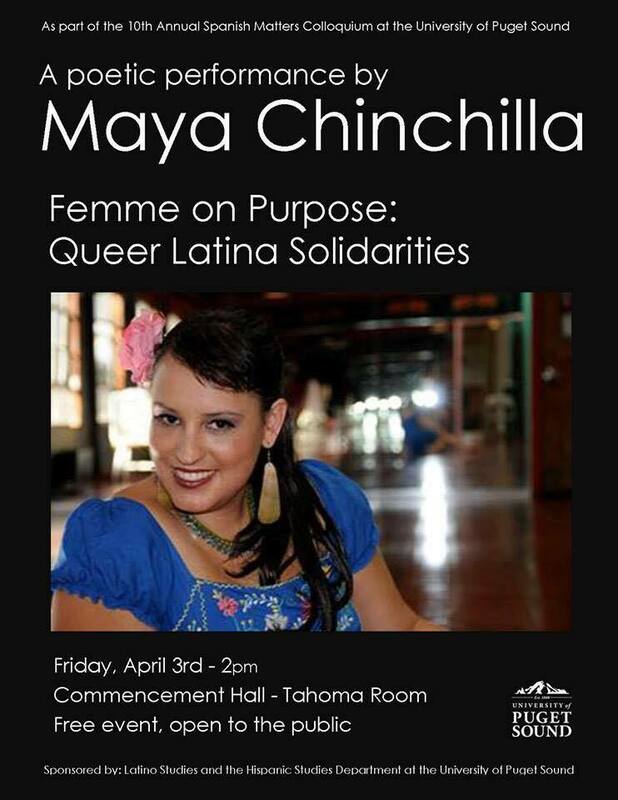 Maya Chinchilla is an Oakland-based Guatemalan femme writer, video artist, educator and author. Maya writes and performs poetry that explores themes of historical memory, heartbreak, tenderness, sexuality, and alternative futures. Her work—sassy, witty, performative, and self-aware—draws on a tradition of truth-telling and poking fun at the wounds we carry. Cosponsored by the UCLA César E. Chávez Department of Chicana/o Studies, the Latin American Institute, the Department of Gender Studies, the Office of Instructional Development, and the CSRC. 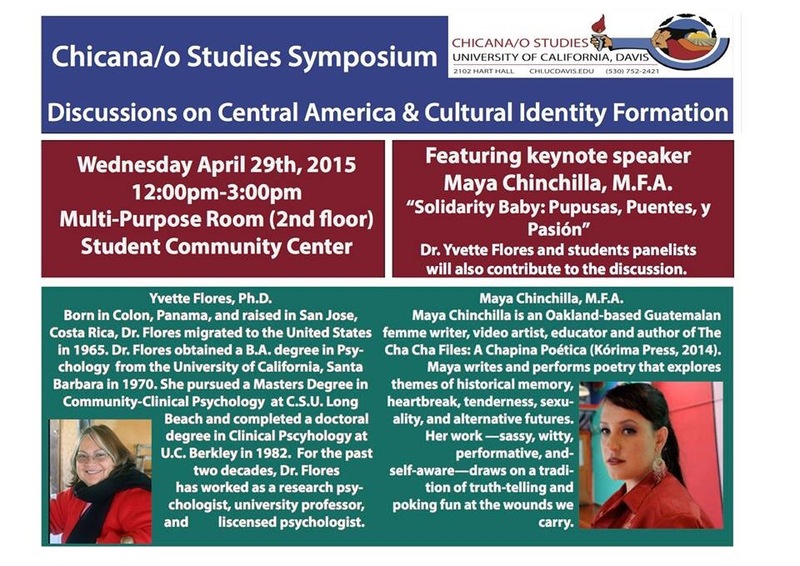 Central American symposium at UC Davis-today! Help me get to the Lambda Literary retreat for emerging LGBTQ Writers! I have the incredible honor of being selected as a Literary Fellow to work with Cherrie Moraga as part of Lambda’s Summer Writing Retreat for Emerging LGBTQ Voices. This will be my first opportunity to develop my playwriting in a professional and intensive setting. 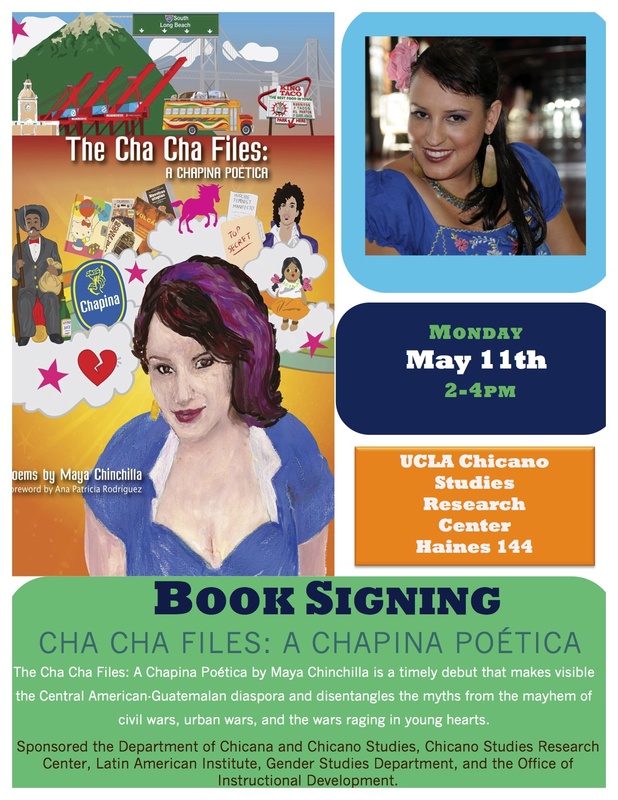 As many of you know I published my first book of poems and stories “The Cha Cha Files: A Chapina Poética” last year and have been teaching part time and seeking new job prospects while touring my book. Teaching is incredibly rewarding but in order to take my work to the next level, I need to take advantage of this opportunity to spend focused time with gifted master writers. The space and time to write in a dedicated community of writers is a precious gift and necessary investment in the work I want to keep producing. I was awarded a partial scholarship but I cannot go to this retreat without your support. I am looking to raise $850 for tuition, room, board and travel. http://www.gofundme.com/mayalambda and choose a perk or simply donate any amount. I will be selling books and buttons. Come say hello. Tell your Seattle/Tacoma People! It’s free and open to the public. Click here for my mailing list! Click the image or link above to sign up for messages and updates about my events and happenings. I have two really fun and amazing performances coming up. I am so excited for both! I have so much love for the work for both of these organizations. RADAR is so dreamy in all the work they do to support queer writers and Mujeres de Maiz, based in Los Angeles, will be a bit of a home coming for me. I once performed at a Mujeres de Maiz event with my teatrista crew “Las Manas Tres.” I can’t remember the date at this moment but it was long enough ago that we were doing an epic piece about MYSPACE. It was an incredible event and it is such an honor now to be coming back as an author and poeta. I will be there performing my heart out and selling books. Please come say hello at either one of these dates. The Banned Book Book Club celebrates the rich history of banned and challenged book! Each month Radar chooses a theme and asks some of our favorite artists to read from their favorite banned or challenged books. For the month of FEBRUARY, RADAR partners with Galeria de la Raza to bring you some of our most beloved writers who will read from banned or challenged books written by people of color! $10-$20 Donation at the door, sliding scale. Credit Cards and exact change accepted. *This is also our 1 big fundraiser of the year to provide free and low cost programming and to fund our soon to be non-profit! and more announced every week! 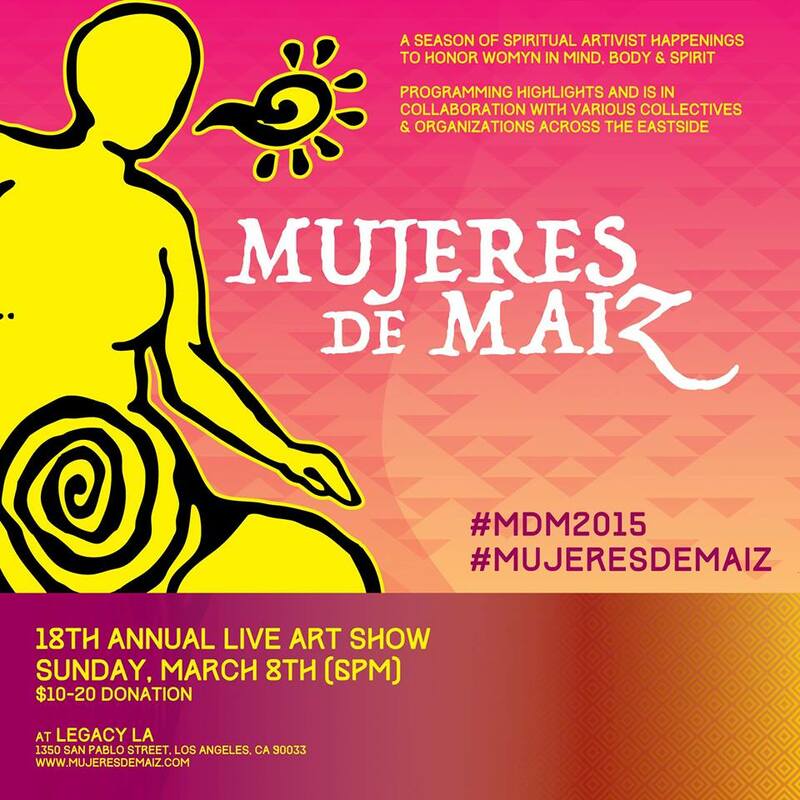 Opens at 5:30pm with over 20 womyn & Q/T vendors selling artesania, jewelry, books, holistic health items, art and much more. Mujeres de Maiz t-shirts, past and NEW Zines will also be available! -All Ages w/ Limited Seating. -Please inbox us for accommodation needs. -Free parking on surrounding streets. -This is an alcohol and drug free Event for the health of our communities and families. -Healthy food will be available for purchase. *No one turned away for lack of funds. Join us for an afternoon filled with stories of heartbreak, tenderness, heavy breathing and delivering the goods. 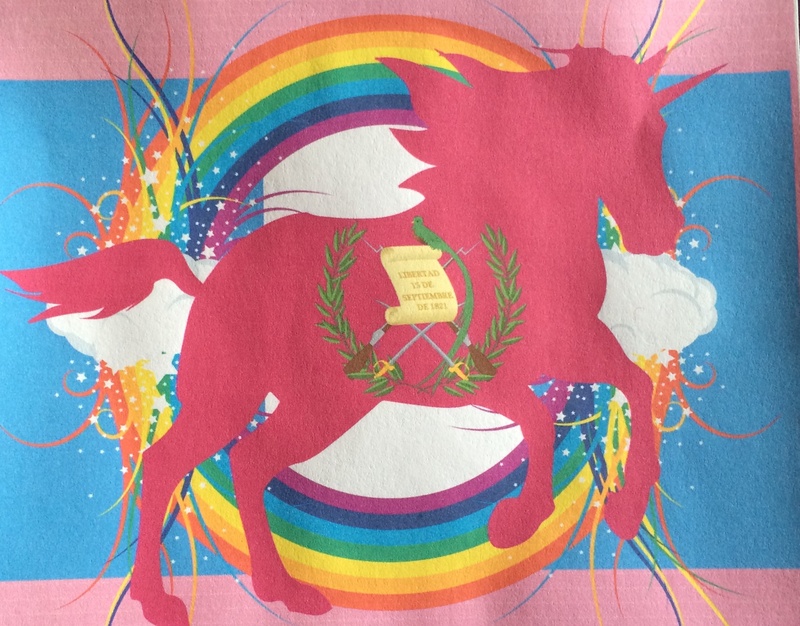 Poet Laureate of rainbows and alternative futures, Chinchilla brings her visions of revolution, survival, and Central American unicorns to New York City joined by a powerful line up women writers, poets and performers. YNANNA DJEHUTY is an Afro-Quisqueyana born and raised in the Bronx. She is a midwife, doula and writer. The focus of her work is the empowerment of women and people of the African Diaspora. She utilizes her experience as a midwife and reproductive health advocate to raise awareness on maternal and reproductive health for women, highlighting the disparities in the healthcare system in the United States for women of color. She is pursuing certification to receive her midwifery so she may continue to serve women in New Jersey and New York. MARIAMA LOCKINGTON calls many places home but currently lives in Fort Greene, Brooklyn. She is published in The Comstock Review poetry journal (2009), Sparkle and Blink Issue 3.8 (July 2012), and is a San Francisco Literary Death Match champion (Episode 46).